5 Bedroom Detached House For Sale in Horsham for Offers in excess of £1,000,000. 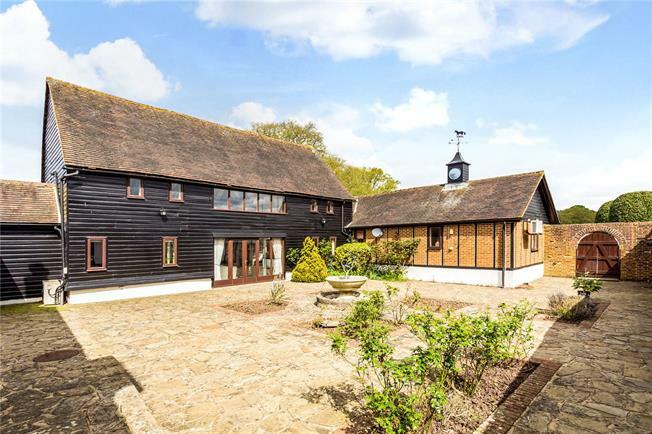 A conversion of a number of attractive barns which come together to form spacious accommodation surrounding a central courtyard and backing onto attractive mature grounds. As shown on the attached floor plan the property provides 4/5 bedrooms, 3 bathrooms all ensuite, a lovely main hallway, dual aspect kitchen breakfast room, dual aspect dining room and a superb partially double height sitting room with useful mezzanine above, which leads to a library/study beyond. Externally there is a superb detached studio, arranged as a one bedroom dwelling, yet with a number of other potential uses. To the rear of the courtyard the pretty single storey barn offers a number of rooms with a number of potential uses, one which does contain a sauna, with shower and wc. The property is pleasantly situated in a semi rural location being at the top of Bashurst Hill. The popular town of Horsham which provides an excellent range of shopping, schools and entertainment facilities is about 4.5 miles. Main line stations with a service of trains to London (Victoria) are located at Horsham and Christ's Hospital. The A24/Horsham by-pass provides links to the M23 giving access to Gatwick Airport, the M25 and the national motorway network. Sporting and recreational amenities include the Broadbridge Heath and Christ's Hospital Leisure Centres and golf at Slinfold Park. the village of Barns Green with it's School, Shop and public house can be reached on foot via a footpath which sits directly opposite the property. The property sits in a lovely mature plot of about an acre (0.4 ha), accessed via a driveway with a central island, which leads around to the double garage and the side of the barn. A very attractive courtyard sits within the barns and is a wonderful, sheltered, private area. To the rear, the mature gardens are a delight, with a magnificent Oak, lawns, a large expanse of patio nearest the house and a tennis court to the rear (albeit now in need of re-surfacing). A former outbuilding has been converted by our client, and is arranged as a one bedroom studio, with a number of other potential uses.